A hallmark of enterohemorrhagic E. coli O157:H7 infection is its ability to form attaching and effacing (AE) lesions on enterocytes. AE lesions are characterized by extensive rearrangements of the host cell cytoskeleton that leads to effacement of the microvilli and formation of a characteristic pedestal structure beneath the bacteria. 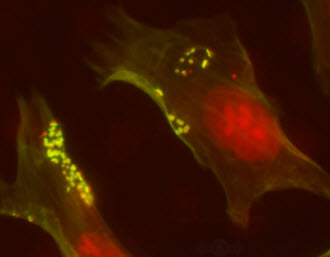 In this image, green shows the HeLa cell actin cytoskeleton, and red shows the bacteria and HeLa cell nuclei. Pedestals are observed as bright green structures, typically associated with bacterial cells. Courtesy Melissa Kendall, PhD. Our faculty in bacteriology and virology study all aspects of the way bacteria and viruses interact with the host. Studies include the nature of microorganisms, the way they replicate, the way they cause disease, the host defense mechanisms that protect against infection, and options for treatment and prevention of infectious disease. A current theme among our group of investigators is to understand the way host cell processes are involved in pathogenesis by the microbe. In some cases host functions are clearly devoted to eliminating or killing the pathogen. Phagocytosis and degradation of bacteria is an example of this. In other instances, the pathogen is able to hijack normal host functions to aid in its own replication. An example is the ability of viral DNA molecules to enter the host cell nucleus by way of nuclear pore complexes. Examples of projects currently being pursued by our investigators include: (a) Studies of Marie-Louise Hammarskjold and her colleagues on messenger RNA synthesis by HIV and other retroviruses. Virus mRNA molecules are transported from the nucleus where they are produced to the cytoplasm by normal nuclear export pathways and also by modifications to the cellular pathways that are unique to virus infections. Dr. Hammarskjold is working to clarify both types of pathways. (b) Dr. Dean Kedes is examining replication of Kaposi’s sarcoma-associated herpesvirus with emphasis on the way the virus becomes latent in host cells. Latency is found to involve attachment of the virus genome to host cell chromosomes. (c) Dr. Alison Criss is studying how the bacterium Neisseria gonorrhoeae is able to survive in the human host by living within neutrophils, cells normally involved in pathogen killing and clearance. (d) Dr. Melissa Kendall, examines how enterohemorrhagic Escherichia coli (EHEC) and non-typhoidal Salmonella integrate environmental signals to colonize the host intestinal tract and coordinate expression of virulence genes. (e) Isabelle Derré investigates how the obligate intracellular bacteria Chlamydia trachomatis establishes a replicative niche inside mammalian cells by hijacking cellular organelles. (f) The Ewald Lab studies the relationship between Toxoplasma gondii and mammalian hosts to understand how inflammation is regulated over life-long infection. The investigation in bacteriology and virology benefit from use of highly advanced equipment and methods toward these research goals. Dr. Mitch Smith is using two-photon fluorescence microscopy to examine events taking place in the nucleus of virus-infected cells. Dr. Hervé Agaisse combines the RNAi methodology and high-throughput cellular imaging to systematically identify and characterize human genes supporting Listeria monocytogenes, Shigella flexneri and vaccinia virus infection. It is important to recognize that many faculty who work on the areas of bacteriology and virology collaborate extensively with those working the area of Immunology, since how pathogens are recognized and cleared by the immune system are integral to disease and resolution. Such interactions broaden the scope of the questions that can be asked as well enrich the intellectual rigor and depth that can be achieved in addressing the key scientific problems. Drug Discovery and Molecular Biology of Pathogenic RNA viruses: Influenza, Dengue and Ebola. The Role of Mitochondrial Fusion and Fission in Tumorigenesis.